Share our commitment and help pave the way toward a brighter future for our community. Join us in creating a Path for All at the Southeast Raleigh YMCA. Your investment in our YMCA guarantees expanded recreational and learning opportunities for children, wellness programs for all ages, increased volunteer service and opportunities for all. 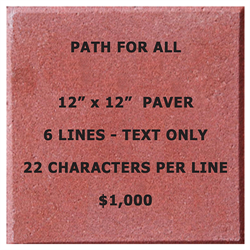 Proceeds of all brick sales will go toward the For All Southeast Raleigh YMCA Capital Campaign. This campaign raises funds for the Southeast Raleigh YMCA located on the Beacon Site in Southeast Raleigh. In addition to the new YMCA, the Beacon Site will include a Wake County Public elementary school, affordable housing and other commercial spaces. 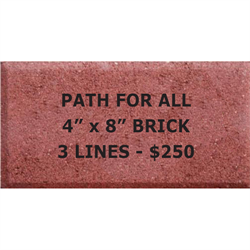 Each 4 x 8 brick can be personalized with your name or the name of a friend, a loved one, or a company. The YMCA of the Triangle reserves the right to approve all wording submitted to be inscribed on brick purchases. All brick purchases are tax deductible. If you do not want to purchase your brick online, you can send us a printable printable order form in the mail. For more than six decades, children and families have come to Camp Kanata to learn about nature, to explore the great outdoors and create new friendships. While our traditions remain the same, our programs and needs are growing. Our capital campaign will help modernize and renovate aging facilities; modern enhancements are vital to Kanata’s future success. We invite you to help us grow in a way that’s beneficial for everyone we serve. The Camp Annual Fund was created to help meet the pressing and emerging needs of YMCA Camp Sea Gull and Camp Seafarer. Gifts to the General Fund provide camperships, staff and leadership development opportunities, program enhancement and community outreach. The Camp Annual Fund was created to help meet the pressing and emerging needs of YMCA Camp Sea Gull and Camp Seafarer. The number one barrier to attending Sea Gull and Seafarer is cost. Gifts designated toward scholarships provide financial assistance to lower and middle income families, allowing us to attract children from all financial backgrounds and life experiences. In return, it makes the experience richer for every camper. Camp Sea Gull and Camp Seafarer have ongoing capital needs that have been identified to strengthen program and mission delivery. Your support will play a critical role in these new and renewed facilities. Contact Camp to discuss specific project designations. If you are here to make a payment on an existing pledge, PLEASE DO NOT USE THIS SITE. Instead, please contact the Financial Development Office at (919) 719-9684 or send us an email. PLAYING FOR A PURPOSE The Golf Marathon is a major source of funding for the Taylor & Kraft Family YMCAs' outreach programs. Golfers have been teeing it up for this annual, fun alternative to traditional-style fundraising since 1991. Each year, 100% of the proceeds from this event benefits YMCA outreach programs like Y Learning and provides scholarships to hundreds of youth, individuals and families who could not otherwise afford to attend YMCA programs. The Jo Anna Lilley McMillan Tradition of Excellence Award is awarded to A.E. Finley YMCA Finley Day Camp staff who are dedicated to upholding the tradition of excellence, quality and the commitment to impacting lives through summer day camp. Funds will be awarded annually to a college age Finley Day Camp staff member. Award recipients will be chosen annually by a selection committee. The committee will evaluate students that have demonstrated achievement and/or have evidence of potential in four areas: faith, leadership, service, and character. Recipients will receive funding from this endowment towards educational needs or leadership training opportunities. 100% of every dollar given to the YMCA Annual Campaign is invested in the lives of people who need the Y. Help make the community a better place to live. Donate today to the YMCA's Annual Campaign. The YMCA of the Triangle has made a significant investment in a shared dream of broad, community-based service in Southeast Raleigh with the purchase of 32 acres along the Rock Quarry Road corridor near I-440. This property will be home to a YMCA facility, affordable housing, an elementary school, and a variety of other services. Each year, more than 20,000 children, families and adults swim at the Taylor Family YMCA pools. But currently, the Taylor Y cannot meet the year-round aquatic needs for the growing community. By modernizing a 20-year-old aquatic center, we can accommodate the growing demand for swim lessons, aquatic exercise and competitive recreational swimming at Wake County’s largest suburban YMCA. Currently, the Taylor Y has 12 lap lanes. The new permanent indoor aquatic facility will provide a total of 24 lap lanes. If you are here to make a payment on an existing pledge made by your Y Guides tribe, PLEASE DO NOT USE THIS SITE. Instead, please contact the Financial Development Office at (919) 719-9684 or send us an email. As a reminder please do not include financial payment information in your communication. Y Guides is committed to helping the YMCA meet the growing needs of our community. Tribes raise money to support others in the Y Guides program through scholarships, as well as YMCA programs including LIVESTRONG at the YMCA, Y Learning and Camp High Hopes.